Jay-Z and Kanye West’s latest joint video speaks like a Molotov cocktail. Directed by France’s Romain Gavras, who also oversaw M.I.A.’s bloody “Born Free” video, the clip for Watch the Throne’s martial, foreboding opener is as gripping and cinematic as it is oblique. 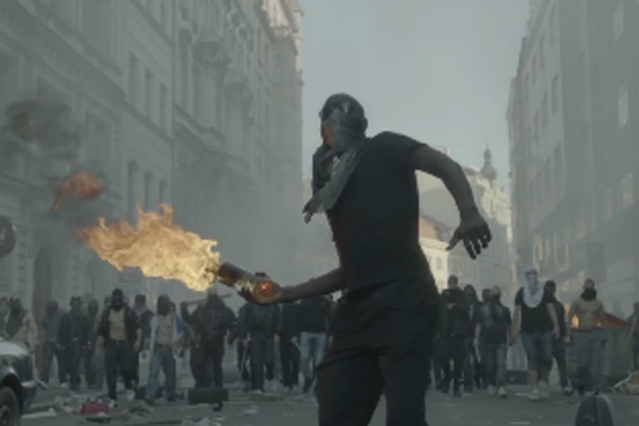 Shot in the streets of Prague — which could almost be mistaken for lower Manhattan until you notice the Slovak storefront lettering and unfamiliar marble statues — the clip shows an apocalyptic confrontation that pits angry young people with improvised explosive devices against police in riot gear. As featured guest Frank Ocean softens Hova and Yeezy’s sharply barbed existential musings with his own soaring croon, the conflict erupts into a Hobbesian state of nature, complete with brutality on both sides, lasers, and, of course, an elephant. It’s great for nodding your head to. It’s majestically ugly, then. And by causing us to take pleasure in its senseless violence, the “No Church in the Wild” video ingeniously inoculates itself against criticism — ’til we all without sin, let’s quit the pulpittin’. But part of the enjoyment, too, is trying to figure out whether the chaos really is as meaningless as it appears. The historical echoes of the Arab Spring, the Occupy Wall Street movement, and the street-level desperation of contemporary European politics are obvious, but the video, like the song, gives us no easy answers. A Molotov cocktail has no moral value in itself. It’s only as virtuous as the cause it serves. As people the world over have been noticing in recent years, markets are only as responsible as the human beings who use them — profits are value-neutral, too. And commercial art, which also exists on a market, need not serve a higher master, either. This fascinating video, then, just might be like Jay’s short-lived “Occupy All Streets” T-shirts, or West’s quiet Occupy Wall Street visit: Nobody knows what it means, but it’s provocative. It gets the people going, but in what direction, as with the “Born Free” clip, its creators appear loath to decide. Imagine there’s no heaven, Hova and Yeezy command. And then they show us hell on earth. Which turns out to be as awesome and unknowable as an Old Testament deity.